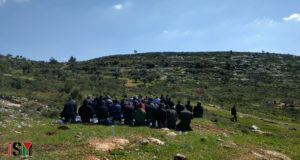 Last Friday, April 27, around 100 Palestinians and their supporters gathered in the West Bank village of Nabi Saleh to protest the nearby illegal Israeli settlement and the unjust conditions of life under occupation. 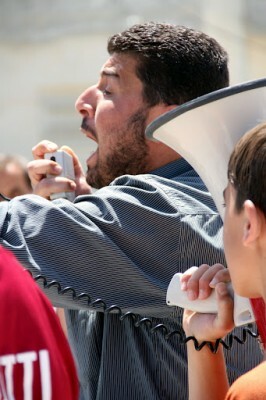 The protest comes just a day after Israeli ‘independence day’ celebrations. This week’s demonstration painted a stark picture of the harsh reality still faced by Palestinians 64 years after what they know as the Catastrophe, or Nakba. Following the midday prayer on Friday, demonstrators assembled in the center of the small village of Nabi Saleh and marched down the main road towards the neighbouring Israeli settlement of Halamish. The non-violent procession of residents, solidarity activists, volunteer medics, and journalists were only halfway down the hillside when they were met by the waiting Israeli army, who had blocked the road at the village’s entrance. Upon sight of the chanting marchers, the military deployed the infamous “skunk truck.” Protesters were sent in a panicked sprint back in the direction they had come to avoid being drenched by the long-reaching streams of foul-smelling skunk water. After finding safety behind makeshift roadblocks of rocks strewn across the road, the Palestinian youth, or shabab, equipped only with homemade slings, countered with stones and paint balloons. The crowd let out a cheer when a boy landed one such balloon on the skunk truck, splattering white paint across the windshield. Celebration of the small victory was cut short when soldiers responded by unleashing a barrage of tear gas and rubber-coated steel bullets that sent the unarmed demonstrators running for cover. From this point on, the young Palestinian stone throwers and Israel’s modern army engaged in a familiar call and response that lasted for hours. During a moment of relative calm, one Israeli activist narrowly avoided being struck by a surprise tear gas canister, but did not escape the terrible effects of the noxious fumes that billowed around her. Other canisters started small fires in the dry grass of the hillside, and some were hurled back in the direction of the army. Friday’s demonstration comes one week after the release of Bassem Tamimi, a prominent community organizer and resident of Nabi Saleh who spent a year in prison on charges of “incitement” of such protests. Despite the fact that Israel’s settlements in occupied Palestine are a violation of international law, and resisting the occupation is widely considered to be a moral and legal right of the occupied, Palestinians who exercise these rights face constant arrests, house raids, and violence at the hands of the Israeli forces. Tamimi, who Amnesty International has named a prisoner of conscience, was unable to attend the day’s demonstration as he remains under house arrest in Ramallah until further notice. 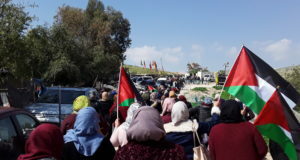 The weekly demonstration in Nabi Saleh began in 2009 when the encroaching Israeli settlement of Halamish illegally annexed additional Palestinian land, including the village’s fresh water springs. Since then, the Israeli army has regularly denied the town its right to demonstrate and suppressed the protests with excessive force. In December, protester Mustafa Tamimi was killed at a demonstration when he was shot in the head with a tear gas canister at short range. Despite the real dangers that come with resisting the occupation, the residents of Nabi Saleh show no sign of giving up. 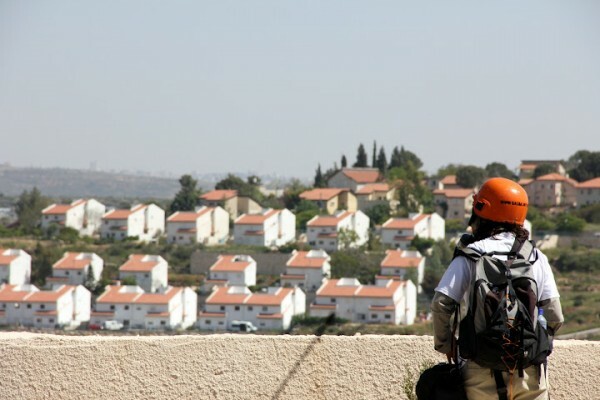 The growing Halamish settlement is a daily sight and reminder of what has been taken from them. So while the settlers hoist the Star of David in celebration of the independence of the “Jewish State,” the residents of Nabi Saleh continue to struggle because for them, the creation of Israel has been nothing short of a castastrophe. Sam is a volunteer with International Solidarity Movement (name has been changed).